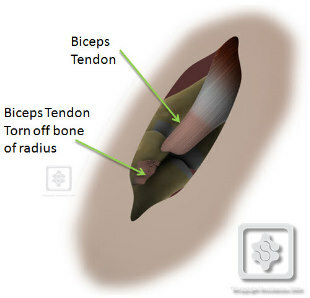 There are many different techniques for repairing the ruptured biceps tendon. Our prefered method is to use the Endobutton Technique described by Assoc. Prof. Greg Bain, but other methods are equally successful. Please discuss with your surgeon. 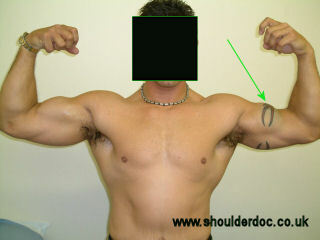 A small incision is made over the upper forearm, where the biceps should attach onto the radius bone. 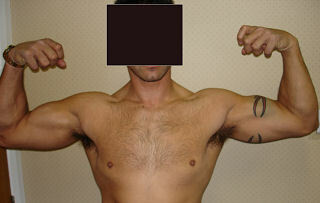 The retracted biceps tendon is retrieved through the incision. 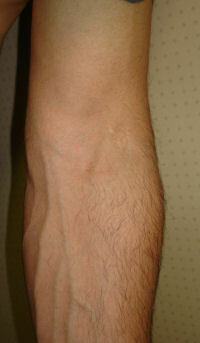 Sometimes another incision higher up the arm may be required to find the tendon. The radius is prepared to encourage healing. With the Endobutton technique the tendon end is actually buried inside the bone to create a strong repair. Strong sutures are threaded through the tendon in a specific interlocking way to ensure a strong repair of the tendon to the bone. 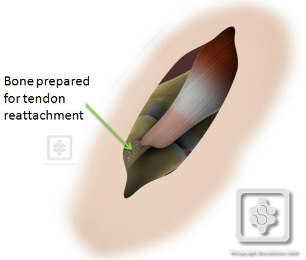 The tendon is then fixed to bone with the Endobutton, suture anchors, an interference fit screw or bone tunnels. In laboratory tests the Endobutton technique has been shown to be the strongest. After the surgery a sling is applied for comfort. At two weeks the sling is discarded and active movement encouraged. Strengthening is started at around six weeks and by twelve weeks you should be able to return to normal activity including sports. Physiotherapy should be arranged after your surgery. Click here for details of the Physiotherapy programme . It can take up to 6-12 months to regain the full strength of your biceps. You must not eat or drink anything after midnight the day before your surgery. When you wake up following the procedure you will be wearing a sling. The operation is usually a day-case procedure, so you should be able to go home about 4 hours after the operation. A physiotherapist will see you in hospital to teach you the appropriate exercises. You may also see an occupational therapist to give you advice regarding the use of your arm. This operation is usually done through one or two or small incisions. There will usually be a dissolving suture in the wounds, and small sticking plaster strips over the wounds. These should be kept dry until healed. You may shower with waterproof plasters in the meantime. You can move the elbow as comfort allows but should avoid any sudden movement or lifting. An appointment will be made for you to see the surgeon or specialist therapist 2 weeks post-operatively. For the first six weeks all heavy activities of daily living for example lifting a bag, lifting a full kettle etc must be carried out using your un-operated arm. If appropriate an occupational therapist will be available to give you advice on how to do this. For more information Click Here . Your physiotherapist and surgeon will advise you when it is safe to resume your leisure activities . This will vary according to your sport and level, as well as the period required to retrain your muscles with physiotherapy. You will not be able to drive for a minimum of 2 weeks. Your surgeon will confirm when you may begin. For individuals who need to take heavy loads through the biceps i.e. rugby players, isokinetic measurement of biceps strength can provide a guide for return to sport.